Johnathan Williams III tallied 16 points and eight rebounds as the Missouri Tigers held off the Elon Phoenix for a 78-73 victory in non-conference action at Mizzou Arena. Keith Shamburger also made an impact for the Tigers (5-4) offensively with 16 points and five assists, while D’Angelo Allen provided a spark off the bench with 12 points and seven rebounds. 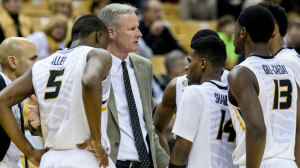 Montaque Gill-Caesar chipped in 10 points to help Missouri pick up its third win in four outings. Elon (5-4) had its three-game winning streak come to an end despite a stellar showing by Luke Eddy, who poured in a career-high 24 points in 27 minutes off the bench. Kevin Blake recorded 14 points and six rebounds, while Tanner Samson finished with 10 points on 3-of-10 shooting from the floor. The Tigers dominated the first stanza, as they hit on 59.1 percent of their field goal tries, including a 6-of-9 clip from 3-point range, en route to a 46-27 halftime lead. The Phoenix were limited to 24.2 percent efficiency from the floor in the opening 20 minutes of play. Elon refused to go away used an 11-0 run to reduce the deficit down to 70-69, with only 54 seconds remaining in regulation. The Tigers drained their final 10 free-throw attempts, including eight over the final 43 seconds to keep the Phoenix at bay. Missouri converted Elon’s 11 turnovers into 13 points, while the Phoenix registered only four points off of the Tigers’ 12 miscues.